Over the past few months, I have received many inquiries asking when the Level 3 Rhythm Cards will be available in the Shop. I am so pleased to announce that they are here! As with the other items in my Shop, the rhythm cards are a PDF download that includes the license to print from the PDF as much as desired for use with your own students. The Level 3 PDF contains 22 pages of rhythm cards (5 on a page), for a total of 110 cards. 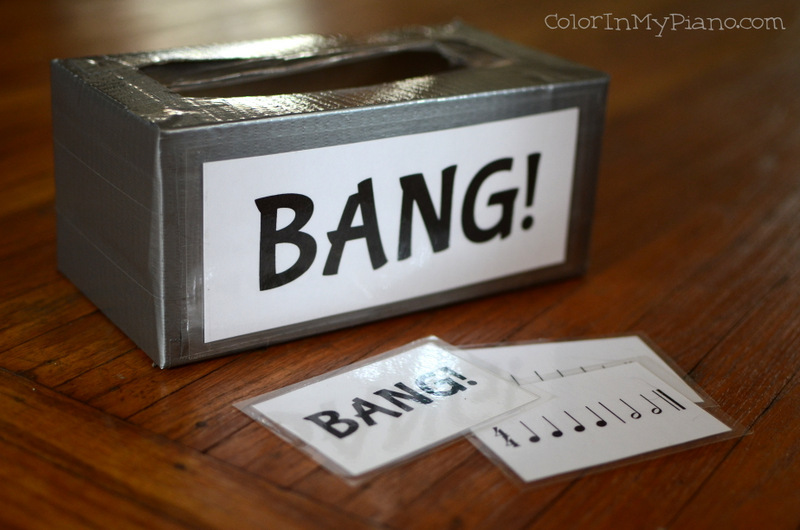 These cards work great for a variety of games (such as Swat-A-Rhythm, the Rhythm Train Game, or the BANG! game) and also work well to send home with students as part of their weekly assignments. Each card contains a three- or four-measure rhythm example. The rhythm examples in Level 3 use ties, sixteenth rests, and various combinations of sixteenth notes with eighth notes. The time signatures used are 3/4, 4/4, 6/8, 9/8, and 12/8 time. As indicated in the sneak peek post, I held a rhythm camp called “I Got Rhythm!” last week. :) We met for 4 days in a row, 2 hours each day. This week, my students and I are in the middle of rhythm camp! …and playing games and making crafts, too! I will be blogging more details about our “I Got Rhythm” camp pretty soon. Stay tuned! I love being able to print out rhythm cards for my students to practice at home. I can give them just a few cards to start, and add more advanced rhythms and time signatures as needed. My students store their cards in a zipper bag and bring them to their lessons each week. Ask the student(s) to randomly choose 2 or 3 rhythm cards with the same time signature. First, make sure that the student(s) are able to accurately clap each rhythm card separately. As they master each card, they may add it to the train behind the engine, with the caboose at the end. When all the cards have been added to the train, ask the student(s) to clap the entire rhythm. Challenge the student to see how many rhythm trains they can make, or assign the student to make a rhythm train every day at home. Playing the Rhythm Train game makes clapping rhythms just a little bit more fun. :) It works well both in the private lesson (it can be played at the piano on the music rack, or off-the-bench on the floor) or in group classes. You can download the free pdf of the train cards and instructions on the Printables > Games page, under “Rhythm Train game.” Enjoy! Note: If you don’t have any rhythm flashcards, you can find a pdf download to purchase at ColorInMyPiano.com/shop/. Your purchase includes a license to be able to print the rhythm cards as many times as you wish, as long as you are using them with your own students. A frequent question I receive from blog readers is about what method/software do I use to make music worksheets. Since discovering music fonts (and publishing my blog post on music fonts last Spring), I have been using music fonts more and more for my printables and using Finale less and less. Finale is great and totally necessary for printing compositions and arrangements, but it’s not quite as convenient for making music worksheets. To help answer some of those questions about how to get started using music fonts for creating music worksheets, I decided to create a quick video showing the process for creating a rhythm worksheet using my two favorite music fonts: MusiSync and Rhythms. These two fonts are so simple to use, you might not even need a character map (as described in the full post about music fonts). Before getting started, you will need to download and then install both of these fonts onto your computer. You will also need the program Microsoft Publisher (part of the Microsoft Office suite), or a similar program. Update: Here is a follow-up video that talks about using two other fonts, that will allow you to create melodic examples in your worksheets. And here is one more video tutorial, showing another option for making worksheets: using png image files of various music symbols. The Level 1 Rhythm Cards have a been a popular item in the Color In My Piano shop. I’m excited to announce that Level 2 has been released! Some example cards from Level 2.